LeadMaster CRM experts are ready to help you get started. Register now for your free 30 day trial or give us a call 800-699-4164 to speak with a CRM consultant to see if LeadMaster is the right solution for you. 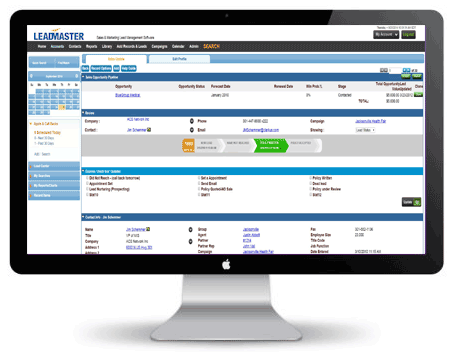 LeadMaster helps you to manage clients as well as automate and streamline your marketing processes. It also helps you capture, nurture and convert leads. It is cloud based so it is easy to manage, easy to deploy, easy to learn, and easy to use. It is adaptable to all business sectors, plus it is customizable. You enable and use the features you need now, and add more as necessary in the future, all at an affordable cost. CRM Success = Fast Learning Curve, Customizable, All-in-1, Flexible, Feature-Rich. Email marketing, lead nurturing, web integration, landing pages & automated business rules. Combine your CRM and your Help Desk into a single integrated solution. Hundreds of integrations via Zapier plus Encompass, QuickBooks, MindBody. Know what’s happening with your sales leads & Increase revenues by conversions. 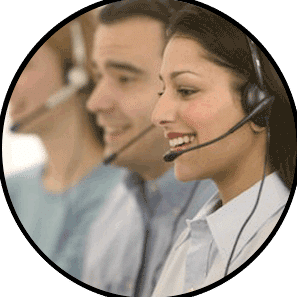 Cloud Call Center & Click-to-Call Integration, Automated Dispositions. Open, Assign, Prioritize, Automate Case Management and view Case history. Save money with radically simple Lead-Xpress. Provide to your extended sales team. Register now and for the next 30 days you’ll have access to one of the most complete solutions available for managing sales and marketing activities. See for yourself why more and more people are choosing LeadMaster every day. 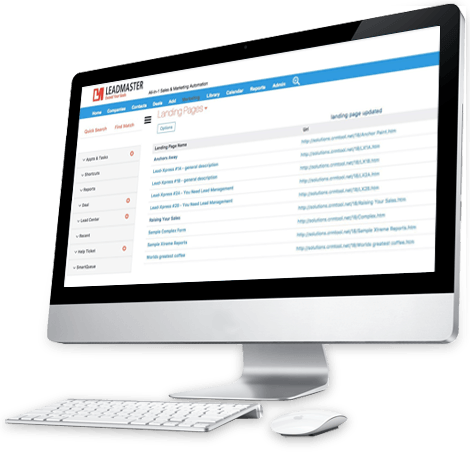 LeadMaster marketing software has everything you need to run successful inbound marketing campaigns that make people interested in your business and happy to be your customer. It’s all your marketing tools, all in one place. Built-in email marketing, lead nurturing, web integration, landing pages & automated business rules. 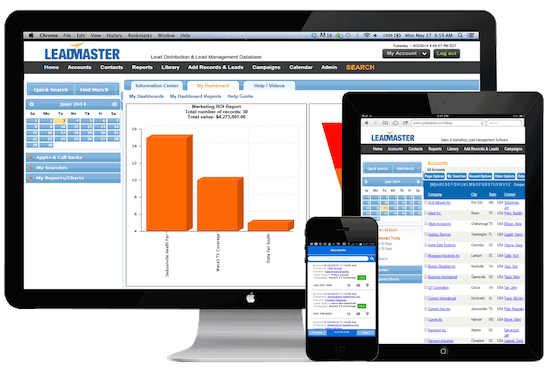 LeadMaster CRM can work together with your sales team to deliver your ultimate objective – more sales for your business. Whenever your team has any interaction with a lead or a customer, they will have all the information that they need at their fingertips – past orders, contact information, proposal details, social information etc. Hundreds of integrations via Zapier plus Encompass, QuickBooks, MindBody and more. LeadMaster also integrates with applications such as WordPress using either HTTP Post or Map Web Forms to Custom Forms. For sending information to other applications, LeadMaster has a Workflow Function called ‘Upload Records’ that sends data using POST, GET or SOAP calls. Start Growing With LeadMaster Today! Easy-to-train, easy-to-use, quick-to-deploy and loaded with powerful business automation features. Helping maintain existing customers, and establish healthy relationships with prospects. If you sell through an extended network of manufacturer’s reps or VARs you’ll love Lead-Xpress. 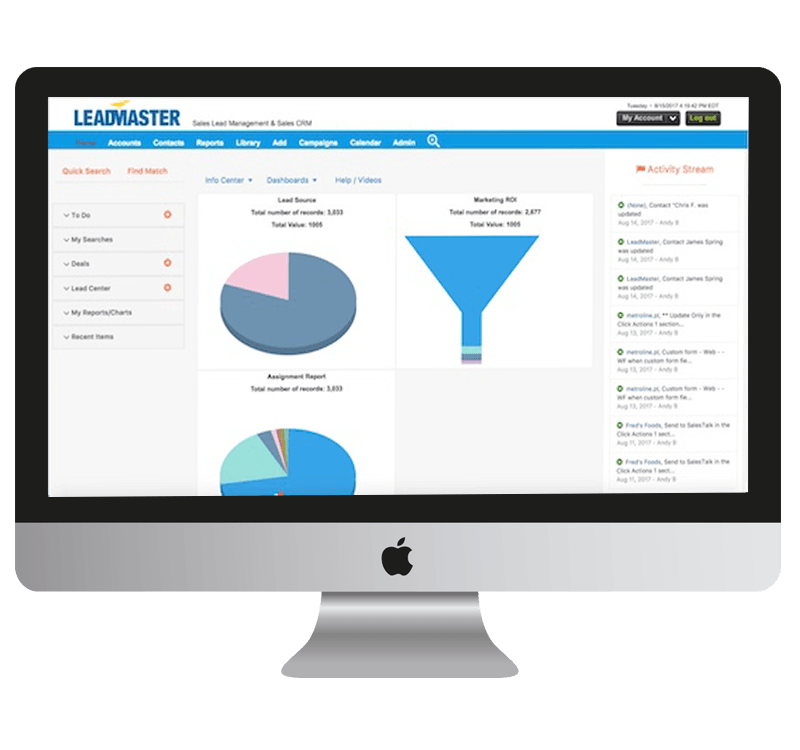 LeadMaster’s All-In-One Lead Management system is tailored to the education marketplace. Automation means insurance agents spend less time doing paperwork and more time on what’s important – sales! Speed-to-Lead / followup on leads quickly. Smart Queue to prioritize leads. Workflow to automate process.